Starting off in "30 Days Without Incident", the first episode of the fourth season, things are going well at the prison. The protagonists have taken the Governor's leftover followers under their wing, so now the prison is home to more people, living in multiple cell blocks. And in the time since we have last saw them, they've set up a garden. They're raising pigs for food. They have formed a council. And they have a stand outside where meals are handed out. It ain't no Bahavia, but everyone is fed and protected. 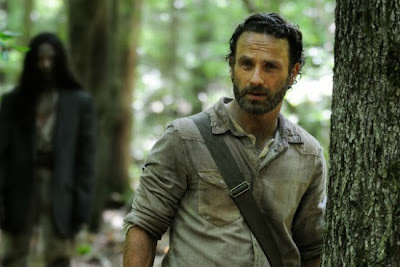 Alone in the forest outside the prison, Rick encounters a tattered, broken woman. She begs Rick to help take her catch back to her husband. 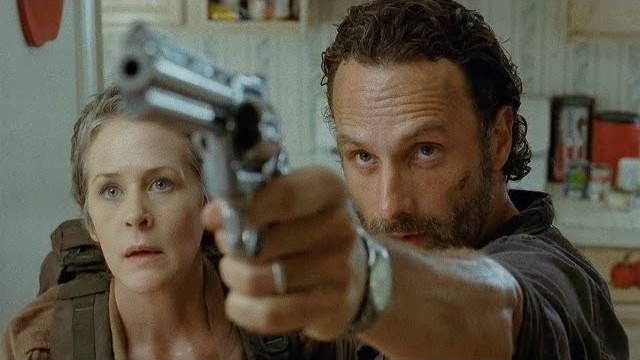 Rick is hesitant, and as soon as he lets it slip, the woman wants to get her husband, and go live at the prison. Rick only agrees to meet her husband, but warns her: "You try anything... anything... you're gonna be the one who loses." Her haunting reply: "I don't have anything else to lose." Meanwhile, some of the others (including Daryl, Michonne, Glen, and the now-established Sasha) go for a run at a supermarket. The military had set up base there, but now it's abandoned, and crawling with walkers. In the store, one of the new characters (Bob) knocks over a shelf of wine, and the noise attracts the walkers on the roof. The ceiling has rotted, so walkers begin raining-shooting-down through the ceiling. Visually, it's extremely clever, and executed in a grusomely terrific way. Also in this episode: Carol teaching the kids about knives, and how to use them (how disturbing). The new characters are all good-looking and boring. The show's portrayal of romantic relationships is a true weak spot, and always has been. It is the non-romantic relationships (the bond shared between Daryl and Carol, for example) that are the most fascinating. 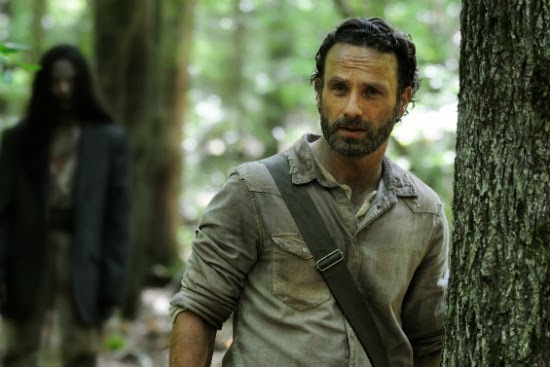 Rick's interaction with the woman he finds is tense, but predictable and pointless. And in usual Walking Dead fashion, everything in "30 Days Without Incident" is dragged out as long as possible. "30 Days Without Incident" was really, really bad. Highlights include Michonne's determination to hunt down the governor, and the supermarket scene. In "Infected", the second episode of the fourth season, an advancing virus is turning the prison's inhabitants very ill, and people are dying. As a result, a string of walkers attack within the prison's walls. And outside the fences... the walkers are beginning to break through. "Infected" was light years better than the previous episode. In this one, things are starting to pick up, very slowly. ("Infected" and "30 Days" should have been combined into the first episode of the season.) I do like how the show is introducing so many new characters, and then killing them off quickly and by the handful. It gives the show more suspense, makes it more dramatic, and keeps it unpredictable. Overall, "Infected" was a good episode... until about the last twenty minutes. I am thinking of the penultimate scene when Carol finds Lizzie and Mika at the fence, after their father dies. The show's crew is trying (here, and in other places) to add so much emotion into the show... but most of the time it fails. And so, is there even a point to it? I am not suggesting that the characters should be two dimensional. But hello... it's a show about a zombie apocalypse. The show needs less coupling, less moral debate, and more conflict, more drama, more action. In the show's bleak, nihilistic setting and atmosphere, with such grim, desperate characters... the conditions are just not suitable for the emotional depth they are trying to attain. In episode three, "Isolation", nothing really happens. I mean, more than usual. The only highlights were Rick rescuing Carol at the pump, and Daryl, Michonne, Bob, and Tyreese's escape from the crowd of walkers. The revelation that Carol killed Karen and David wasn't very shocking. In episode four, "Indifference", Carol's explanation to Rick, of why she killed Karen and David, is really contrived. The Carol and Rick storyline was intriguing. But the other one, with Daryl and the others... God it was dull. 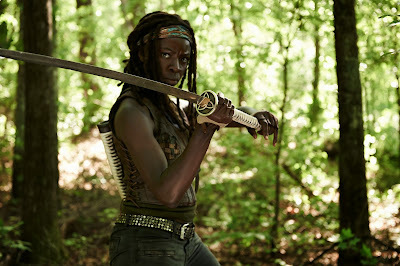 Over the four seasons of The Walking Dead, the quality has been inconsistent, ranging from horrendous to terrific. And yet, over time, the show's ratings have only continued to rise. This speaks volumes about the show, as well as the people who watch it. In the past I have gotten sucked into watching crappy shows. I would watch a few episodes to see how it went... and then I would have to keep going. Maybe there was a character I wanted to follow. Maybe there was a mystery I wanted to see the conclusion of. But now, I have decided, I can no longer do this. There is too much good material out there to waste one's time with the bad stuff, hoping it will eventually pay off. The biggest thing I was looking forward to, coming into the fourth season, was the conflict between our survivors and the Governor. And I know that The Governor will be back. But I won't be sticking around to find out what happens.